WASHINGTON, DC – In 2015, 21 young people between the ages of 11 and 22 filed a major lawsuit against the US government for failing to limit the effects of climate change. In Juliana v. United States, the plaintiffs argue that because they will have to live with the repercussions of global warming for much longer than anyone else, on average, the government’s failure to protect the environment violates their constitutional rights to equal protection under the law and due process. The philosopher Peter Singer points out that this case represents a historical turning point, because it addresses the rights of children and future Americans to a livable environment. But the trial is about more than the environment; it will have far-reaching implications for intergenerational justice more broadly. In deciding Juliana v. United States, the Supreme Court must grapple with the fact that the US Constitution does not explicitly recognize future citizens. While it was the first of many national constitutions to embody the Enlightenment principles that citizens are equal under the law and endowed with unalienable rights, it applies those principles only to living Americans. Future US citizens will have rights only after they are born. That might sound reasonable. But if the interests of future Americans are not protected, powerful actors today can drain resources from the not-yet-born. The result is environmental degradation, unsustainable public debt, and generations of under-educated, unemployable people who will have difficulty raising their own children to become productive adults. By demonstrating that younger living citizens suffer more than their older counterparts from short-sighted fiscal and environmental policies, Julianacould be the first step toward recognizing a similar responsibility in the US. It is a small step, but one that could have far-reaching implications for policy, especially at a time when the president and his administration are actively pursuing policies that effectively loot the next generation. And, indeed, US President Donald Trump’s administration has resisted the case at every turn. Earlier this year, a lower court ruled that the case could go to trial, and the trial was set to begin at the US District Court in Oregon, on October 29. But in late September, Supreme Court Chief Justice John Roberts issued a temporary stay of the case to consider a request from the Justice Department to halt it altogether – a highly unusual move. Trump administration attorneys insist that the case is “nonjusticiable,” meaning that the courts are not the proper venue to resolve the issues in Juliana; even if this was not the case, they continue, the plaintiffs lack standing to sue. The US federal courts from the district level up to the Supreme Court – all of which have already ruled that the case should go to trial – clearly disagree. There are parallels between Juliana v. United States and the Supreme Court’s infamous decision in Dred Scott v. Sandford. Scott, a slave, sued for his and his family’s freedom in 1857 – eight years before the US Constitution’s 13th Amendment abolished slavery. Chief Justice Roger B. Taney ruled that slaves and their descendants were “beings of an inferior order” who had “no rights which the white man was bound to respect.” Scott, therefore, had no standing to sue in federal court. Will Kelsey Juliana, the chief plaintiff in the federal suit, also be denied? Already, in the US Supreme Court’s comments about Juliana, there are echoes of Dred Scott. Ultimately, however, the Dred Scott ruling was out of touch not only with basic morality, but also with the growing economic and cultural power of the North and the direction of US history. That is what we are seeing today, both in the Trump administration’s claims that Juliana is nonjusticiable, and in US law’s antiquated failure to recognize future Americans’ rights to a livable environment, unburdened by excessive debt. Opponents of Juliana, including the politically influential energy industry, cynically hope that they can succeed in getting the case dismissed and put generational rights in the hands of a deeply divided – and, for powerful vested interests, pliable – Congress. Like the opponents of emancipation in the 1850s, they count success in terms of the few months or years they can continue to benefit from the Constitution’s lacunae. And they may well be able to hold onto the past a little longer. When it came to abolishing slavery, the US trailed the United Kingdom by more than 30 years – a delay that only made matters worse in the mid-1800s. But the direction of history is clear. The tide is turning against permitting living citizens to exploit their children and grandchildren. 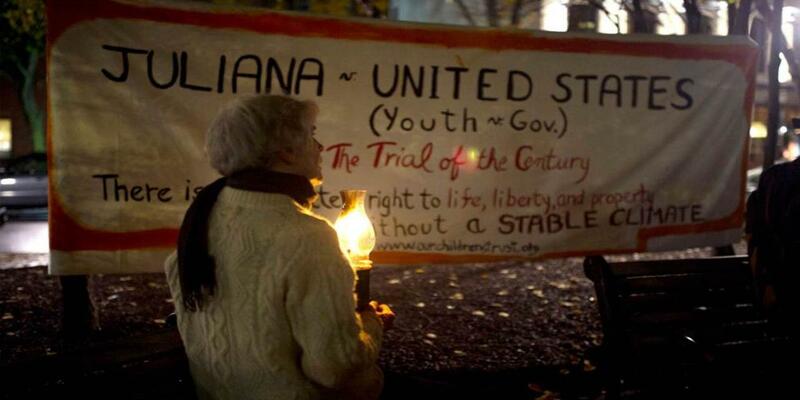 In this sense, whatever the outcome, Juliana v. United States is just the beginning. Copyright: Project Syndicate: The Dred Scott of Climate Change?